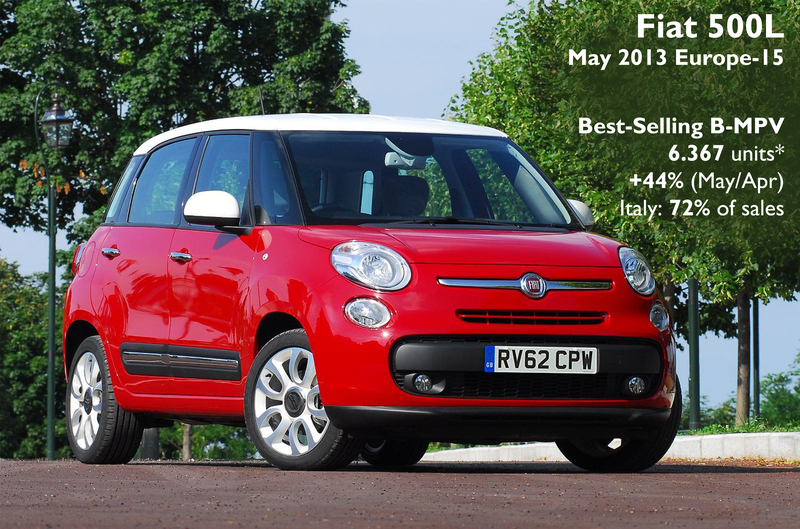 The strong demand the Fiat 500L is having in Italy is making of it a strong dependent model on this market. In May it was Europe’s best-selling small MPV again, after losing that position in April. It was possible thanks to the Italian market, where the 500L occupied a brilliant 5th position in the general ranking, with a record month of 4.559 units sold, or 72% of total sales in Europe-15 (Austria, Czech Rep., Denmark, France, Germany, Greece, Ireland, Italy, Netherlands, Poland, Romania, Slovenia, Spain, Sweden, and Switzerland). The strong dependence on Italy reminds the case of the Panda: it is very popular in its home market, but its rivals do better in the rest of the continent. In my opinion that’s not good at all, as the 500L should follow the success of the small 500, which is popular in Italy but everywhere in Europe as well (Italy counted for 29% of its European sales in 2012). Depending exclusively in one single market can be dangerous and is not part of the company’s target of making of the 500L a global nameplate. The Fiat 500L was the leader in Italy, Greece, and Romania only, and it lost important positions in France, Slovenia, and Spain. This minivan hasn’t been able to take off in the Netherlands, Poland, and Switzerland, where its sales registrations are extremely unstable since January 2013. 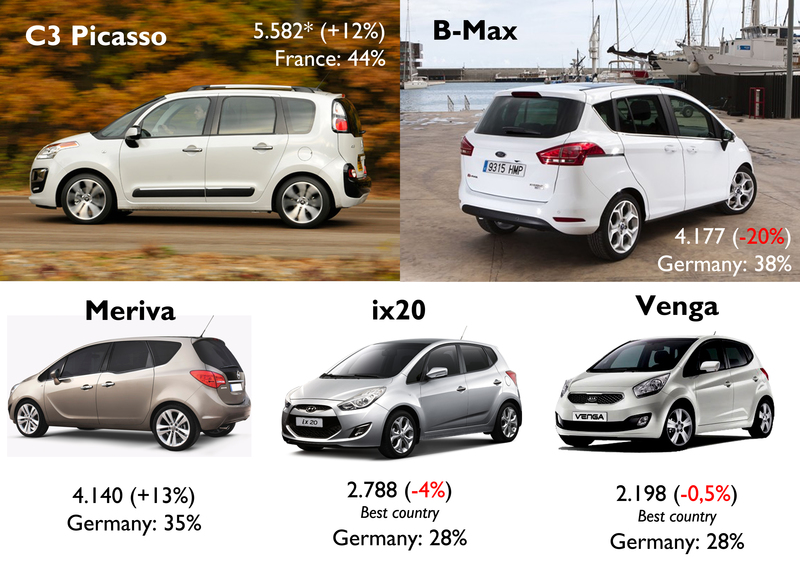 France is still its second largest market (no figures for the UK), but May’s results represent half of March’s (as it happened to the B-Max). Compared to April figures, the 500L sales jumped 90% in Italy, but collapsed in Austria (-40%), Spain (-26%), and France (-13%). In the opposite side there are Romania (+95%), Czech Republic (+40%), and Poland (+150%). The arrival of the Trekking version should boost the sales of the model in Northern Europe markets and Switzerland, where this kind of vehicles are more appreciated. The star of the month was the Citroën C3 Picasso, occupying the second place with 5.582 units, the best result so far this year. The French minivan had a fantastic result in Italy, with a record of 2.203 units, or 235 behind the French registrations. This record was possible thanks to local promotions (it was offered at the same price of the standard C3) in order to face the success of the Fiat 500L. Both, France and Italy counted for 83% of the C3 Picasso’s sales. The Ford B-Max comes third, just few units ahead of the Meriva. The Ford didn’t do very good in May as sales in Germany dropped 31% on April figures, as well as in France (-25%). Actually the B-Max’s registrations fell in 12 of the 15 countries analyzed. Strangely, its sales grew in Italy, where competition is more difficult. This make me believe that Italians are moving from B-Segment to B-MPV one, as the Punto is too old and the offer isn’t quite enough. The arrival of new B-SUV offer is already having an impact on the regular B-Segment demand, but also on B-MPV’s. The 500L Trekking is supposed to be a half way between the B-MPV and B-SUV while Fiat completes its 500X project. 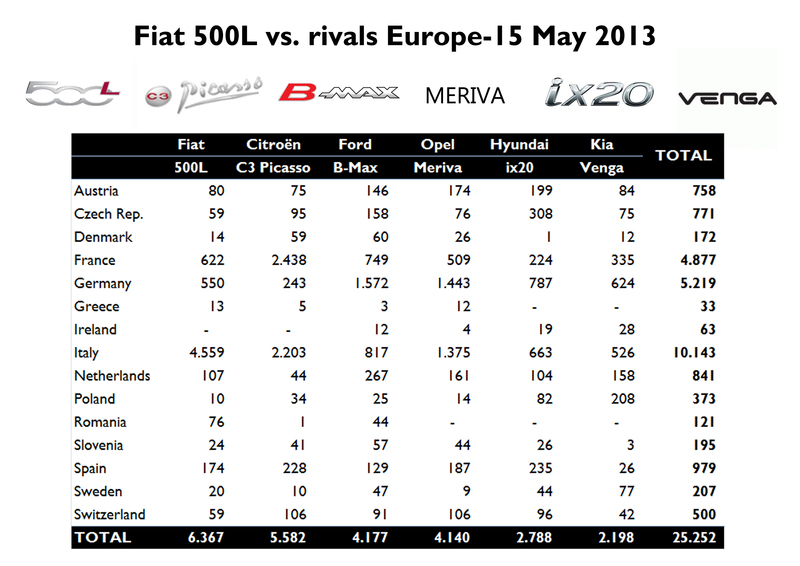 The Meriva had a wonderful result in Italy as well: 1.443 units in Germany vs. 1.375 in Italy! 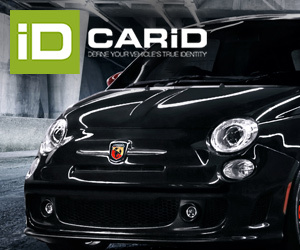 Definitely, the arrival of the 500L shook the segment with big offers and promotions. Finally, the Hyundai and Kia remained stable. – In France and Germany it jostles with the first alternative to the national product. Thanks a lot for your great explanation. It’s always good to go deeper in the analysis and that’s certainly what you did. You’re right: the 500L is still in its growth period and more engines and versions are expected to arrive shortly. Regarding the availability of each market, it would be very interesting to know it, but I’m afraid that’s internal data. And yes, the dependence on Italy is natural not only because it is a Fiat, but because Italy became the largest B-MPV market. We will see how the new 7-seater Living will impact its sales. Do you work in Fiat?